For Poets United Midweek Motif – Abundance. The last of the harvest of my garden. The vegetables have been shared with neighbors. to share and cook there. The smiles will grow like my garden. Abundance in its purest form. I pondered the smell of green. from the earth on the apogee of its orbit. The moon hasn’t changed sizes though. and still I ponder the smell of green. To spread on the chicken breasts I had baked. it smelled so green I felt my fingertips tingle. The tightly dried buds smelled of pine and Thai basil. Smiling at the mini moon. Out of the Kitchen, into the Fire…. When I went in, it was winter. When I came out, it was spring. somewhere in the confusion of the cutting room. sous chef, chef, executive chef de cuisine…. only interested in status and trendy. That day I had enough. That day I walked out and never looked back. him coming in, me going out. the kitchen Samurai was laying it down. Out of the kitchen and into real life now. Those who can – cook. Those who can’t – cook for those they love. and won many a battle of food and taste. eat my food and make happy sounds. Oyakodon: Creepy name, yummy dish. Warm, simple, comforting, easy. The name means “mother and child” = chicken and egg; hence, the cannibalistic creepy part. My husband hates the name and calls it “chicken bowl stuff”. Whatever. 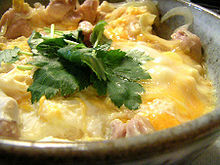 This is donburi (don) – served over a bowl of steamed rice dish. You can use dashi or chicken broth for the liquid. White or brown rice is also your choice. Excellent for lunch or a simple supper. Warms your tummy. Dessert is pumpkin custard. Sweet, spicy, seasonal. Pumpkin pie without the crust. Top with a nice dollop of whipped cream. Served warm or chilled, this is good stuff. A bit decadent and a fitting end to a simple supper. Go ahead and eat two. It will be our secret. Add broth, sugar, Sake, soy sauce and Mirin in a pan. Heat until boiling. Add onion and cook for a minute at medium heat until tender. Add chicken pieces to the pan and cook until the meat is cooked through. Beat egg in a small bowl and pour over the chicken and onion. Cover and cook for 1 to 2 minutes or until your eggs are cooked as you like them. Slide half of egg and chicken with half of sauce over rice in a bowl. Sprinkle with green onion. Two servings. HEAT oven to 350°F. Whisk eggs in large bowl. Stir in pumpkin and pumpkin pie spice until blended. Whisk in sweetened condensed milk, milk, vanilla and salt until blended. Pour into 6 (6-ounce) custard cups. 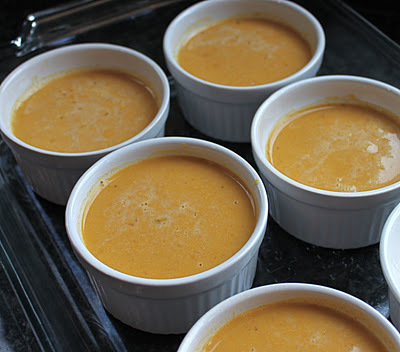 Place custard cups in a 13 x 9-inch baking dish. Place dish on oven rack in center of oven. Carefully pour boiling water into pan around custard cups to a depth of 1 1/4 inches. Bake 35 minutes or until centers are almost set. Remove custard cups from baking dish and cool on wire rack. Serve warm or cold. Top with whipped cream and sprinkle with cinnamon just before serving. Makes 6. This is post 102 and I must say, I never thought I’d come this far. To those of you who have followed and liked and commented, I truly thank you. You all have made my day many times with your kindness and interest. And so I have decided to answer some questions that have come up so you all can read them. 1. Yes, the Samurai and the Wren series is all true. At this point, I have not decided if I will go past Part III. 2. How did I guess Dr. Ken was a forensic pathologist? Well, he went to University of Medical school and obtained his medical degree. When he said he went to Duke, I logically concluded it was for a specialty since he was already an MD. Now…..When he mentioned U of Tennessee, this clinched it. Now UT is a fine school – excellent medical school (which he didn’t need), good law school (which he didn’t want) but – an excellent anthropology department and……The Body Farm. That was the only reason he would have gone and because he was so good, he was accepted and obtained his PhD. When we met, although the Body Farm was fairly new, it had obtained and still has worldwide fame for its research done at the Body Farm. 3. I am proud to a Southern woman. A friend crossed stitched for me: American by Birth, Southern by the Grace of God. 4. I am really a nerd – love my sci fi, fantasy, manga, anime, Star Trek, Star Wars, comics. 5. Someone said it was interesting to meet a real Southern belle with Japan in her heart. I think that is accurate. And yes, in the good ol’ old southern family tradition, I was a debutante. But the deal was, the summer before I went off to university, was mine. No questions. I went to Woodstock, camped out in the desert, and sat on the hood of my car the night the first man stepped on the moon, gazing at the sky in wonder and amazement. I love Japan, the art, the food, the culture and Dr. Ken. 7. No, I don’t think I’m going to take pictures of me cooking. I’ve said it before, you all are grownups (sort of) and probably know how to cook already from what I have read on your blogs. You don’t need help from me because you all are accomplished and knowledgeable. 6. The 11/16 Society is real. 8. In The Walk Series of haiku, the man is a good friend. A nuclear engineer from Japan who is here working for awhile. No romance in the works. He is delightful, handsome, extremely intelligent, and humorous. He and I have a special connection and enjoy each other’s company with much delight. 9. There are several poems about Ken and I scattered throughout the blog. and finally, kanzen sakura means, perfect cherry blossom. Watch The Last Samurai to find out more. Good night Y’all. Sleep tight and don’t let the bed bugs bite!!! and as my grandma Ninny always used to tell me: Sweet Dreams.